If you have ever been a patient or are a professional that uses IV catheters frequently then you know what the term "positional IV" means. At a minimum it means an intravenous catheter that has been placed in an uncomfortable position and is annoying and may even cause a connected IV pump to alarm intermittently and demand attention from the staff as well as add to the restless atmosphere of the hospital setting. At worst a failed IV can result in a critical medical situation. 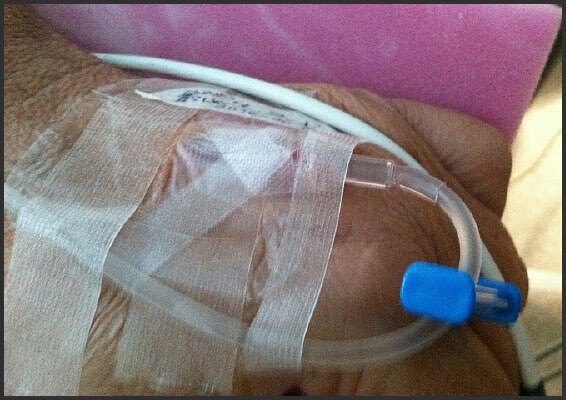 The basic design of IV catheters we commonly use has not been changed in 30 years. There have been wonderful advances in the safety mechanisms, but few have focused on making the actual catheters work better. There are approximately 375,000 IVs placed in the United States every day. Most are installed in places where we bend; hand, wrist, and antecubital fossa are by far the most common. The catheters frequently kink and piston inside the vein as patients move around. 50% fail within 48 hours if they are left in requiring another puncture for the patient to regain access. Approximately $1.4 billion is spent annually in labor costs, materials and litigation remedying problems that result from failed IV access. As our population grows more aged and obese the problem is being compounded. These photos show IVs placed in the wrist. They are positional and prone to dislodgement when a patient moves. The catheter will “piston” (move back and forth) within the vein causing early failure even though a StatLock device is in place. 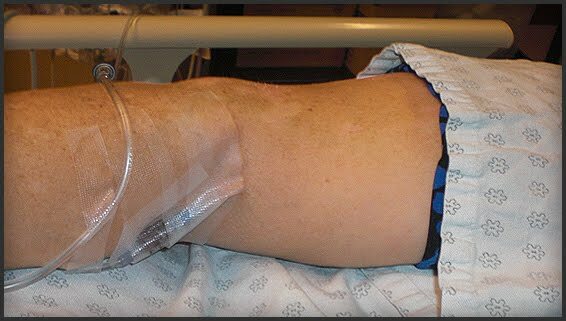 An IV in a hand with large loop of tubing at risk for catching on things and getting pulled out. Anyone who has tried to eat, etc., with one of these in their hand can attest to how cumbersome they are. 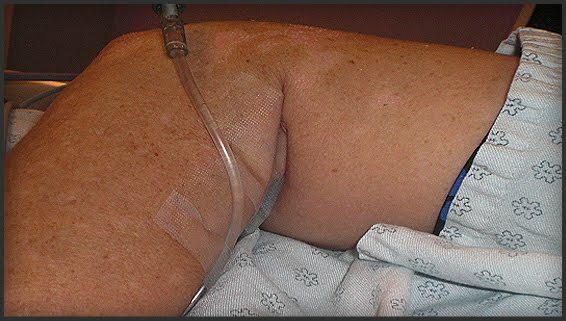 Anyone in healthcare knows the problems associated with antecubital IVs like this one.